programme notes p.2 (of 3). mp3s and pdfs follow these programme notes pages. 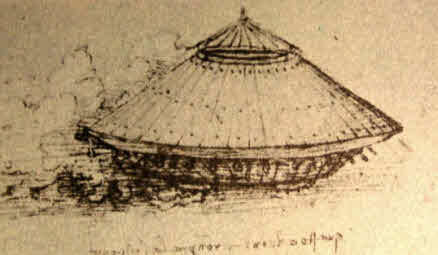 Tank is a truculent, rumbling piece in imitation of Leonardo's famous (but impractical) design. A Moth to the Light was Leonardo's analogy of our pointless strivings in life, so this is a jittery, nervous scherzo. Perspectives of Disappearance plays on ideas of the mysteries of drawing and of personal farewells. 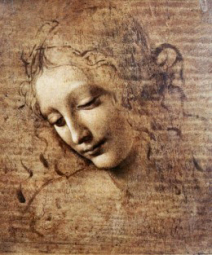 La Scapigliata presents a delicate portrait of a young woman, with perhaps an enigmatic smile like a pre-echo of the famous one in the Louvre (....I am told by Prof Martin Kemp from Oxford University that this work is in fact spurious, though Leonardo-esque! In 2014 I turned a corner in a museum in Parma, and there she was!...). If you have arrived at this page from a search engine (e.g. Google) and cannot see the menu system, please click here.